Please join us for an upcoming event as part of Democrats Abroad's Keep the Congress series of call-ins with Democratic candidates. Where: At a private home in Geneva, please RSVP to attend and receive the address near Parc des Bastions (1205). Requested contribution: At your discretion. It will be matched dollar for dollar up to the $2400 individual contribution limit by a generous Geneva supporter. 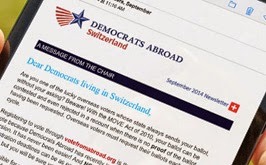 Contributions can be made through the Democrats Abroad website at the event. Time has flown and the midterms are upon us. Monday evening, October 11th, a DA member will be hosting a call-in from southwest Florida grassroots Congressional candidate Jim Roach, a veteran of the Obama 08 campaign, who is taking on two-term Republican scion Connie Mack IV. Jim is a decorated veteran and local businessman who was spurred by the healthcare debate to put his hat into the ring. Take a look at Jim's website here. The district he is running in, Florida's 14th, covers Lee County, Collier County and Port Charlotte County, which include the Naples-Ft. Myers area. Long a Republican bastion, southwest Florida moved towards the Democratic column in 08 with a sizeable Republicans for Obama movement. For a truly chilling read, here is a list of Rep. Connie Mack's voting record in Congress. Rep. Mack has been part of the Republican steamroller, voting against every significant piece of legislation the Obama administration has introduced thus far. The Tea Party is also quite active in the district, and despite the great inroads made in turning Florida blue in 08, the SW part of the state remains red. The going is tough, so let's get going Democrats!